Our Earth have gone through a number of incarnations, each incarnation alternates between pralaya, a cosmic night and manvantara, a cosmic day, just as we alternately pass through day and night, life and dead. Pralaya is the non-physical, preparatory stage and manvantara the physical or lower spiritual development stage. Man have gone through three planetary Earth incarnations (æons) before Earth, and are going through three after Earth before we have finished the complete development cycle. These seven Earth incarnations are called Saturn, Sun, Moon, Earth, Jupiter, Venus, and ending with Vulcan. 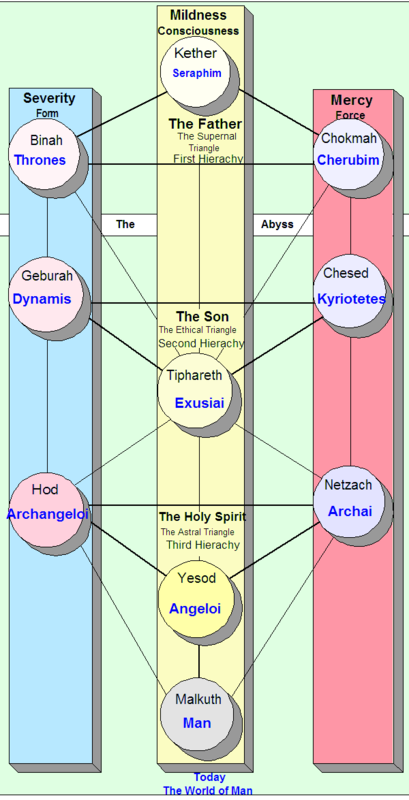 The emanation of Sephira’s in the Kabbalah tree of life corresponds to these planetary cycles. Mars is first part of Earth and Mercury last part of Earth development. Until the middle of Earth round, all development have been made under strict guidance from higher hierarchies, first with the development of sentience on the Earth, through the lower ‘I’ is it possible for man to enter the development consciously. The first seed of man was created on the Earth incarnation called old Saturn, and it’s remnants is the Saturn of today. Old Saturn was a planet which was made of warms. The creator is known as Saturn or Cronos or in Christian terminology, The Thrones [Binah]. The first seed of minerals were created here. At this time man created unconsciously the seed of what would become it’s Spirit Body (Atma). Man had at that time mineral-consciousness. The old Sun was a planet of Light, where a great part of the minerals of man was connected with the etheric, creating a higher life form with plant-consciousness. If one looks at how after a pralaya old Saturn changed into old Sun with the spiritual gaze that moves over the planets one notices that Saturn’s warmth atmosphere condenses into air. Man gets an etheric body on the Sun. He is a shining being. Spiritual beings work through the Sun’s astral atmosphere upon the etheric body, ignite it and thereby make it shine. One calls this the sulfuric process. Some of our development wave of Saturn didn’t connect to the Etheric, so they stayed on the mineral-level. Man creates here, under guidance, the seed for the Buddhi layer of the later development. Zeus is connected to the Old Sun. The Old Moon is a watery planet, with earth like living plants. Here is man connected with Astral stuff, acquiring animal-consciousness. When the Sun passes over to the Moon, air condenses to water. The Moon’s body is a water body. We notice something very strange about this water body. Single water drops change their position in an extremely lively manner and race around with inner mobility. In some respects one can compare this property of the water drops with mercury. That’s why one calls this principle that’s added on the Moon the mercurial principle. The parts are put together into forms by sounds, somewhat like Chladni’s sound figures. First two came together, then two pairs made four, etc., just as one still finds in new plant, animal and human forms. That’s the female principle. The male principle only arose later from pure earth forces. From “Esoteric Lessons“. Some of our brethren from the Saturn development wave didn’t connect to the Astral so they stayed at the plant-level. Here creates man under guidance Manas. The Old Moon are connected to The Mother, Sophia, or Cthlon. On this Earth we have, besides man, the minerals who stayed back on the Old Saturn, the plants who stayed back on the Old Sun, and the animals who stayed back on the Old Moon. When the moon passed over to the earth, water condensed to earth. The precipitating salt process took place on the earth for the first time through the interaction of fire and water. Man arose from female and male and began to dissolve things again through thinking so that evolution could continue. Man received the erring I on earth. From “Esoteric Lessons“. The Earth development phase is split in two parts: Mars, before the Son incarnates, and Mercury after this incarnation, which takes place in the middle manvantara.. In the first part, called Mars, mankind descend into the Physical, into the dominion of the Cthlonic powers, through a kind of repetition of the first three planetary rounds. In the second part of Earth, called Mercury, we ascends again to the spiritual world, and we have been working on it for two thousand years now. In the second part we develop what we previously have created the seed for together with the Gods, that is Sentient soul (Orektikon), the Intellectual soul (Kinetikon), and the Consciousness soul (Dianoetikon), The three aspects of Isis/Sophia. Those who don’t unite with the spirit, stays back. The New Jupiter is known as the New Israel, or New Jerusalem, Paradise or Shambhala, which already exist in embryonic form. Here we will develop Angelic Consciousness. All creation of Old Saturn are one Wave, and it’s our responsibility to get every creation of Saturn, from mineral to man, with us in the development. And this is part of our task now and in the future, and it is a result of the work toward this goal, transforming our astral body to Spirit Self, Manas. The minerals of Earth is transformed to vegetable matter. On Venus we are transforming the etheric body to Life Spirit or Buddhi, and on Vulcan we are transforming the physical to Spirit Body, Atma. On Venus the lowest kingdom is the animal kingdom and on Vulcan the lowest kingdom is the human kingdom. This cycle of seven planets are bound to the Chakras, where Earth corresponds to the Heart, to Christ, who transformed Earth, gave it life, for the new future, called New Jerusalem, the New Jupiter. The Creation are described by Steiner in “From the Akasha Chronicles” and Max Heindel in “The Rosicrucian Cosmo-Conception or Mystic Christianity“.